When this feature is enabled, an "Entered" checkbox will be shown on transactions' documents. You can then mark documents as entered after adding them into your accounting system such as Quickbooks, Lonewolf, or another external system. Click the checkbox next to [Enable Entered Docs feature]. This feature can only be enabled by a master admin. When enabled, control who marks docs as entered by granting the "Can enter documents" permission to appropriate admin users. 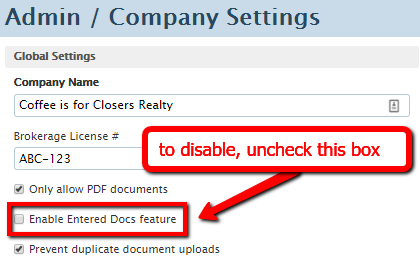 Uncheck the checkbox next to [Enable Entered Docs feature].